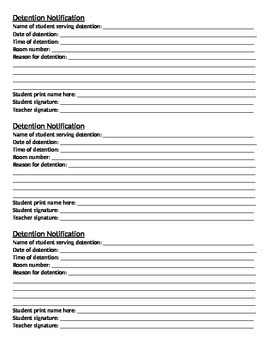 This is a form to give to students when they owe you a detention for whatever reason. It is a reminder form for them to hold on to so they don't forget. It includes things like the date and time of the detention, location, reason for detention, etc. There is also a place for both you and the student to sign. There are 3 slips on the document that can be cut to save paper. Please visit our store for great keyboarding/typing materials, Microsoft Office materials, business-related materials, icebreaker activities, holiday word searches/word scrambles/trivia, etc.